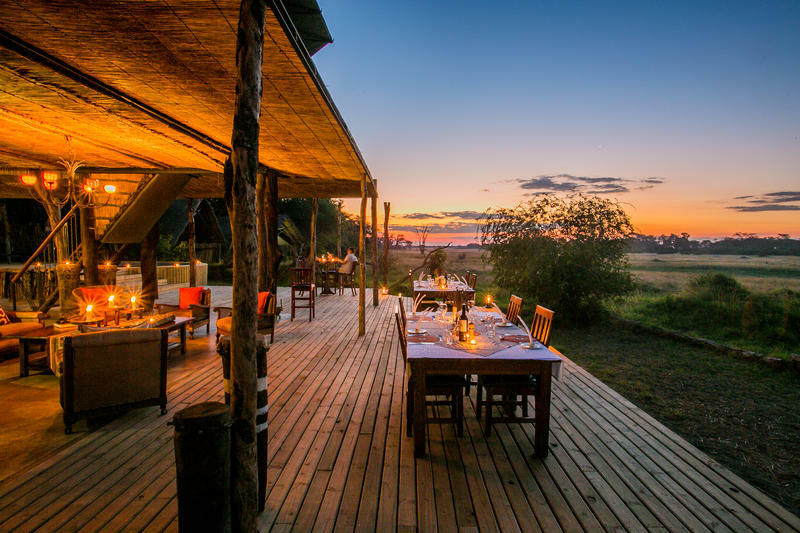 Located in the heart of the National Park, The Hide offers a life-enriching safari experience for its guests, from its fantastic game viewing right on your doorstep, to a variety of daily activities to suit everyone and the warm and welcoming staff, who make you feel like family from the minute you arrive. The Hide is located inside Hwange National Park, approximately 3 hours from Victoria Falls. 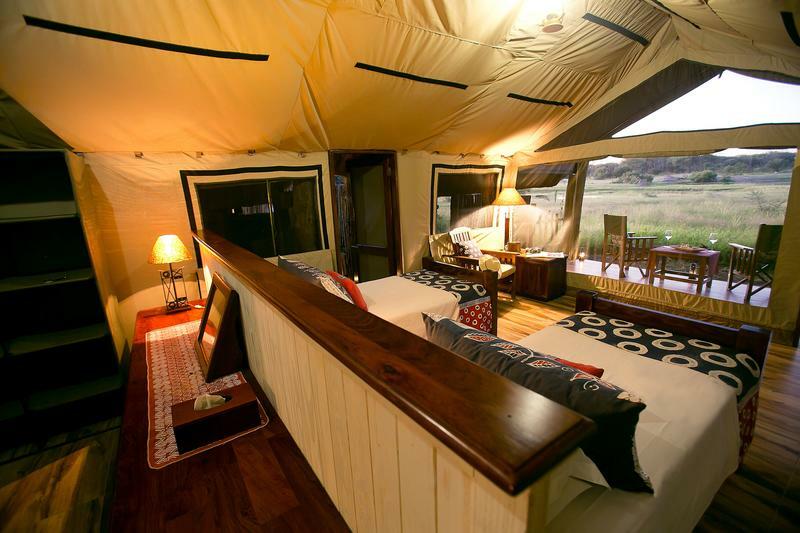 There are ten deluxe tents at The Hide, accommodating up to 20 guests. All facing the nearby waterhole, you can sit on your own private deck and watch the comings and goings of the local wildlife. Each tent is under a thatch roof and are mosquito-proofed, featuring en-suite bathrooms with indoor and outdoor showers, a fan for your comfort in summer and extra warm blankets and hot water bottles for the cool winter months. Relax and take in the 360-degree views of the nearby waterhole from the Main Lodge. Enjoy a drink from the self-service bar or take a dip in the private pool. Venture underground into the waterhole hide to see elephants frolicking in the water. At night, settle around the fire pit and relive the highlights of the day. The team at The Hide are dedicated to making your stay the trip of a lifetime. Because The Hide is situated on its own private concession the range of activities offered is wider and more exciting. There is no limit to the number of activities you can do, the hardest part will be choosing how to spend your time. Game drives are the best way to see the variety of wildlife and scenery of the park and they almost always yield unexpected sightings. The Hide team have a fleet of specially designed safari vehicles and in the expert hands of their guides, you’ll find yourself heading out through the acacia-fringed grassy vleis and through the teak forests in search of Hwange’s Big Five. Encountering big game on foot is the ultimate thrill, safe in the knowledge that there is a trained, armed guide on hand to look out for you. Walking gives you a completely different experience of wildlife and the bush and its just nice sometimes to get out there and stretch your legs in a place that is so uncontrived, beautiful, wild and vast. Somehow your senses are heightened when on foot and you see, hear and smell things that you would miss in a vehicle. Walking is also the best way to appreciate the small magic of the bush. The park has a notable bird population with over 400 species recorded to date; the variety is truly astonishing. Morning, afternoon and evening/night drives will normally head out for 2-3 hours through a variety of eco-systems and habitats. Hides are very much part of safari tradition. Essentially, the concept is to disguise a little safe room as a termite mound or other piece of the natural landscape and slip inside via the back door. There are two hides at The Hide! The first is a little way away from the camp and a guide will accompany you there and ensure you are comfortable as you watch the wildlife unseen. Guests can also make little independent forays into the underground hide from camp, which emerges on the edge of the waterhole, giving you a startlingly up-close view of this incredible micro-world.